Southern Oregon’s natural beauty has given the region its well-deserved high ranking as a world-class tourist destination. But when prospective adventure visitors thumb through their guidebooks and surf the Internet to plan their southern Oregon trip, many close the books and shut down the computers, their heads swimming at the sheer immensity of their task. Southern Oregon teems with action-packed adventure tours and activities. Where to visit? What to do? Even in southern Oregon’s diverse, ever-changing terrain it’s hard to believe you can taste wines on a peaceful, shady, vine-clad hillside one day, roar up huge sand dunes in a souped-up dune buggy the next, fly along the Rogue River in a jetboat at warp speed, and crash through class 3 whitewater rapids, all within a couple of hours’ drive. This, the first of my two-part series on an adrenalin junkie’s tour of southern Oregon, offers up three exciting speed-thrill adventures: a dune buggy ride on North Bend’s towering sand dunes, a thrilling jetboat trip down the Rogue River (which definitely lives up to its name), and rafting through some serious whitewater canyons on the Rogue. 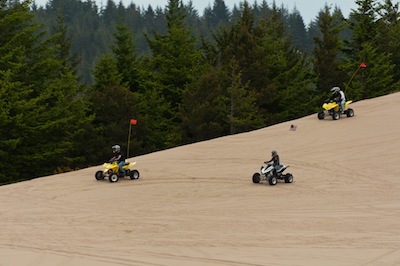 My adrenalin tour begins on the Oregon coast near North Bend on a Spinreel Dune Buggy Rentals trip on Oregon’s largest dune riding area. Clinging tightly to our four-man dune buggy, we lurch and wheelspin up, over, and around towering white sand dunes and wend our way along sand trails through islands of coastal vegetation and Douglas firs. We cruise past small lakes tucked away among the dunes. Finally, as we crest an enormous dune, we look down on the churning Pacific Ocean over a magnificent panoramic view along miles of flat, hard, sandy beach. With Spinreel, you can drive your own buggy or take a 30-minute or 1-hour tour with one of Spinreel’s experienced guides. Our knowledgeable guides gave us a crash course about the native foliage, ecology, ocean, and wildlife as we buzzed along. But for adrenalin seekers, the best part is creeping up to what seems like a vertical drop-off and then driving over the edge. We’re expecting to go cartwheeling and tumbling down the steep dune, but our faithful chariot sticks to the side of the dune, defying gravity. OK, so I definitely experienced a few “pucker factor” moments on some of these downhill slopes and when we went careening up and across what appeared to be vertical dune slopes. I felt somewhat reassured when my Spinreel guide told me that they place great emphasis on safety. All of their vehicle operators watch a safety video, go over the riding area map, and go through a vehicle orientation to make sure that all drivers are comfortable with the vehicle operation. If you’ve never driven a dune buggy or ATV before, I’d suggest you hire one of their guides, so you can just go along for the ride, hanging on to the roll bars with white-knuckle grips. The other advantage of having a guide do the driving is that they are familiar with the terrain and can point out scenic spots as they flash by. Helmets are provided with every rental and are required to be worn by everyone operating or riding in any vehicle. If you choose to go it alone, after the vehicle orientation the Spinreel staff leads you on a 60- to 90-second trip out on the dunes to ensure you are comfortable with operating your vehicle. 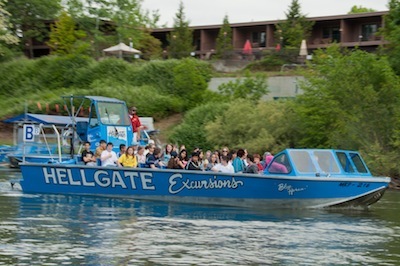 The Hellgate Jetboat Excursion is billed as the Northwest’s #1 river trip, based out of southern Oregon’s ultimate river town, Grant’s Pass. And I’d say the billing is on the mark. This high-powered jetboat tour gave plenty of thrills and spray as we careened down the wild and scenic Rogue River through breathtaking gorges and past remarkable rock formations and northwest forest-covered shoreline. It’s more than a wild ride, though, and you don’t get bumped and jolted around like you do on the dune buggies. Guides point out native plants and animals, interesting geological formations, and historic points of interest along the river. Walking Grant’s Pass’s bustling streets is also a pleasant diversion — the whole town is set up for tourism, so you’ll find plenty of excellent restaurants and other recreational activities like hiking, kayaking, sailboarding, fishing, and whitewater rafting. People don’t go to this secluded lodge, reached by driving along a tortuous winding road, to see tourist sights. They go for the complete relaxation that only a historic old lodge overlooking the salmon-laden Rogue River can provide. Morrison’s Rogue River Lodge is considered southern Oregon’s premier rafting and fishing resort. But after recharging your batteries for a day or two, that insatiable craving for an adrenalin rush starts to rear its ugly head. What to do for your fix? Ride some wild class 3 whitewater through the “entertainment” section of the Rogue. Morrison’s Lodge has its own expert whitewater guides and rafts, and can cover up to 20 miles if you’re a glutton for rough riding punishment. 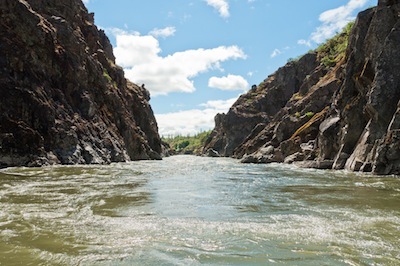 If you want to prolong the agony (and, let’s face it, bliss), you can take a three-day rafting and camping trip. Back at the lodge, you’ll want to take advantage of the plethora of outdoor activities offered by the lodge’s experienced guides, like Steelhead fishing, horseback riding, hiking, and tennis on the lodge’s courts. The lodge’s tastefully decorated interior retains its original rustic 1940’s character. It has a great history of famous visitors. At Morrison’s Lodge Restaurant dinners are all inclusive, with a blend of country style and gourmet cuisine, and are served with northwest and California wines.